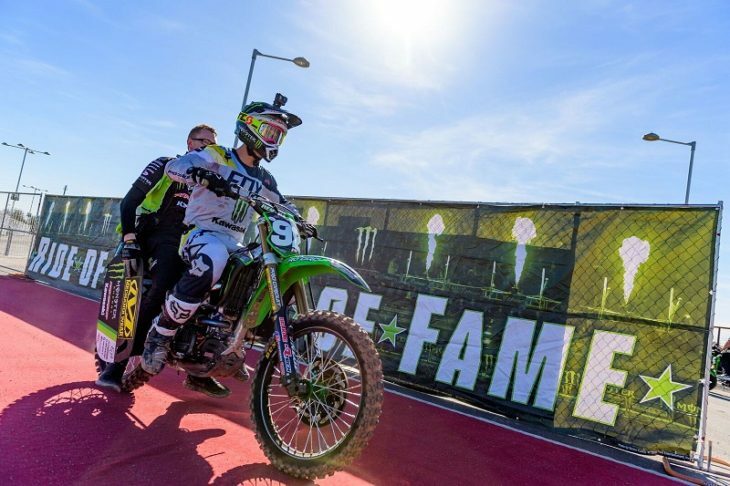 Corona, Calif. (January 31, 2018) – The Monster Energy Pro Circuit Kawasaki duo of Joey Savatgy and Adam Cianciarulo will race the first of two day race events for the Western Regional 250SX championship this weekend at Oakland-Alameda County Coliseum in Oakland, California. This is the series’ first visit to the Bay Area this season with the fifth round marking the halfway point of the 10 round championship where Savatgy currently sits third and Cianciarulo fourth in the points standings. Cianciarulo battled back from a tough start last weekend to land on the podium in Arizona. He has been working on his starts and is ready to go after his sixth career win in his first trip to the Oakland-Alameda County Coliseum. After a solid week, Savatgy is ready to be back at the front and contesting for his second win of the season. The winner of last week’s holeshot knows the importance of a good start and is ready to do it again, without a trip to the LCQ. During Savatgy’s last trip to Oakland in 2016, he collected the win and is looking to repeat the feat in 2018. Prior to Saturday’s race, the Monster Energy Pro Circuit Kawasaki riders will be signing autographs on Friday, February 2 from 6 – 7 p.m. at East Bay Motorsports in Hayward, California. Saturday’s race from Oakland-Alameda County Coliseum will be broadcast live on FS1 or the FOX Sports GO app starting at 4 p.m. PT/7 p.m. ET.